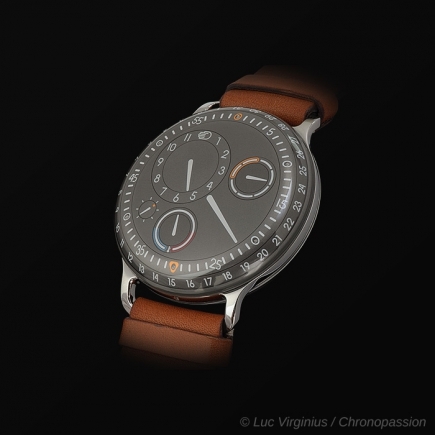 Ressence | 17'500 € Tax inc.
RESSENCE TYPE 1 : ANY MORE ORGANIC AND IT WOULD HAVE A PULSE ! The Ressence Type 1 features an automatic winding movement, with indications for hours, minutes, seconds and days of the week. All the time indications appear to be displayed by high contrast hands on subdials. 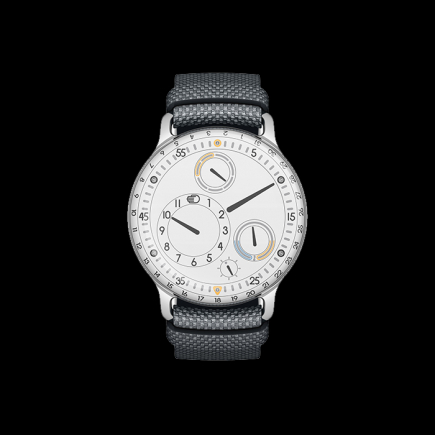 So at first glance, the Ressence Type 1 looks like a fairly normal wristwatch, although one obviously well designed for maximum legibility. And maximum legibility is the first clue that there is more to the Type 1 than first meets the eye, much more. Nothing seemingly too far out of the ordinary there. Except that absolutely everything about the Type 1 is extraordinary. There are no hands, there is no crown, nothing is flat and nothing is as it first appears. And with its softly flowing curves, the Type 1 looks as if it may have organically grown in nature rather than have been engineered in a workshop by man. The face of the Type 1 is constantly changing, just as a human face changes with each passing emotion. What appear at first glance to be "hands" are in fact markings on orbiting discs, or, more accurately, rotating discs within discs. Each of the hour, second and day indication discs rotates on their own axis, while simultaneously rotating 360° every 60 minutes inside the complete dial which rotates to display the minutes. With traditional hands replaced by discs providing a poetic abstract representation of time, all of the indications are on one curved surface and never overlap. 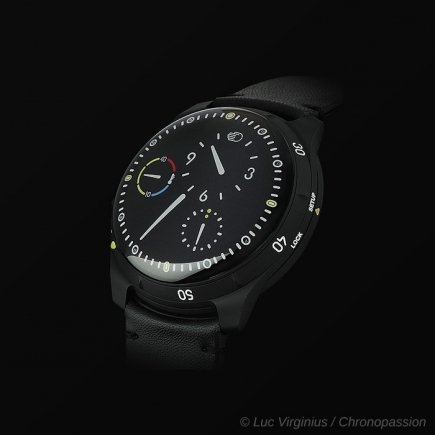 Traditional hands protruding above the dial are obvious evidence on the mechanics beneath and Ressence founder Benoît Mintiens, an industrial designer by profession, chooses to focus on the user experience of reading the time rather than the distraction of the mechanics involved. That doesn't mean an absence of complex mechanics, just that they are out of sight. The Ressence Type 1 provides further evidence of Leonardo Da Vinci's adage that "Simplicity is the ultimate sophistication." Rotating 2-dimensional discs within a rotating two-dimensional disc requires a complex module of elaborate gearing in itself – and the mechanism was awarded a patent. However, the Type 1 takes this mechanical complexity and adds to it a layer of esthetical sophistication, through its curves. No satisfied with disguising the mechanical nature of a wristwatch by dispensing with traditional hands protruding from the dial, Mintiens has further concealed evidence of being engineered-by-man in virtually eliminating straight lines in the architectural forms of the Type 1. Straight lines are rarely found in nature and even more rarely found on organic life forms. The near biological look of the Type 1 is further highlighted by its lugs, which appear to have grown out of the caseband like branches from a tree, rather than have been simply added on as is usual. This effect was achieved by machining them from the same Grade 5 titanium block as the case, rather screwing or soldering them to the case. With its sumptuous curves, the Type 1 is a timepiece to be held and caressed rather than simply worn. The Type 1 features an organically curved sapphire crystal flowing right down to the case rather than sitting on top of a bezel. The dial itself is also curved, as are the indication discs within, requiring inclined axels for each disc. The top sapphire crystal actually follows the curve of the dial and these curves are both complemented and reinforced by a symmetrically curved sapphire crystal on the back. 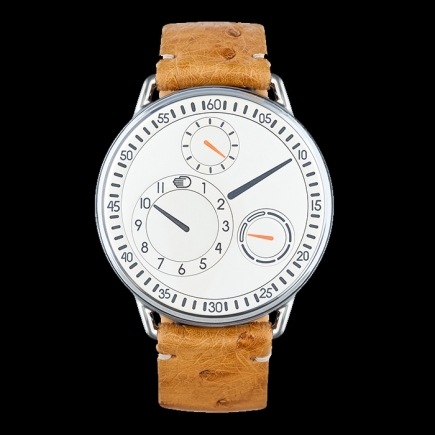 The convex back of the Type 1 is designed so that its centre touches the wrist between the bones; coupled with a light weight of just 75 grams, this ensures that the Type 1 is a very comfortable watch to wear. And in a nice little optical effect, wrapping the sapphire crystal down to the caseband tricks the eye into seeing the watch as even slimmer than it is. While the caseband is in polished Grade 5 titanium, 80% of the case is sapphire crystal, making the Type 1 one of the most scratch-resistant wristwatches available today. A crown sticking out from the side of a watch is blatant evidence of its mechanical nature, so naturally Benoît Mintiens has dispensed with the crown entirely. Instead of a crown, the whole sapphire caseback can rotate within a ball-bearing cage. The automatic winding movement can be hand wound by turning the caseback clockwise, the time set simply by rotating the back anticlockwise then setting in either direction. In keeping with the Ressence philosophy of concealing the mechanics, the automatic winding rotor is not immediately obvious. 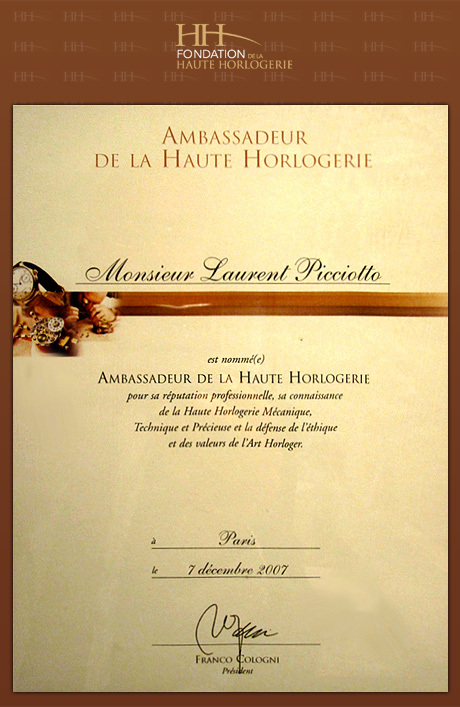 However, it can be seen turning under the sapphire crystal caseback.